Research from Gartner predicts that by the year 2020 the number of connected devices will reach 50 billion. All this connectivity brings new sources of data, new sources of intelligence and innovation to organisations globally. 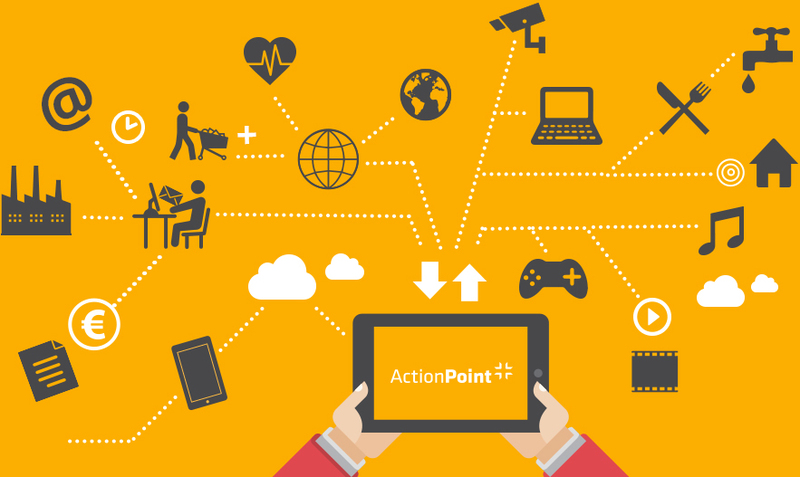 Action Point has helped many clients to benefit from the Internet of Things, enabling them to develop new products, services and revenue streams. One of Action Point’s key strengths is the proven ability to bring together all the components of IoT to help our clients to truly benefit from the many sources of data. To this end, Action Point has developed close partnerships with some of the leading technology companies in the world such as Dell and Microsoft, whose systems enable us to securely capture the data, allowing us to develop the applications that analyse and report on it. Action Point has also developed close relationships with electronics manufacturers in order to provide custom sensors for any IoT solution. Our partner ecosystem supports the delivery of an enterprise IoT offering that provides our clients with insights into their information, so they can make intelligent decisions. Action Point worked with EI Electronics to build an IoT cloud and mobile software solution to connect their range of Carbon Monoxide (CO) and Smoke alarms up to a central management system. Action Point’s solution is targeted at facilities managers that have hundreds of CO/Smoke alarms under their control, enabling them to be pro-actively alerted to incidents and to better manage their devices. The solution also streamlines the installation process by providing real time testing of the device to ensure connectivity to the wireless mesh network. The mobile element of the solution allows an alarm installer to install, test and configure each alarm in a building, to ensure that they have a secure and reliable local mesh connection to at least two other alarms in the premises. It allows the installer to configure the mesh network so it is connected to the cloud via a local gateway. The cloud service enables a facilities manager to closely manage their alarms, monitor their current status such as last time they were tested, their battery level and their dust chamber level. When an alarm is triggered on a premises, this is relayed to the cloud whereupon the cloud service will notify the building manager via email, text and voice phone call (with a pre-recorded message). Action Point worked with B&B Electronics to build out a full cloud-based IoT configuration and management platform. This IoT management system allows for B&B to add bulk cloud configuration to their full range of products. The only configuration that remains local to the device is internet connectivity settings (DHCP/IP/Gateway/DNS). Once the device can connect to the Internet, it contacts the Action Point IoT configuration cloud system. This means that a B&B customer that has purchased perhaps hundreds or thousands of devices can log into the cloud system, take ownership of their device, simply add it to a pre-existing configuration template and watch as the device receives its hundreds of configuration settings according to the template. This results in the management of a swarm of IoT devices becoming a trivial task rather than a tedious device-by-device activity. Reimagine your business to create new revenue models, products, and services.